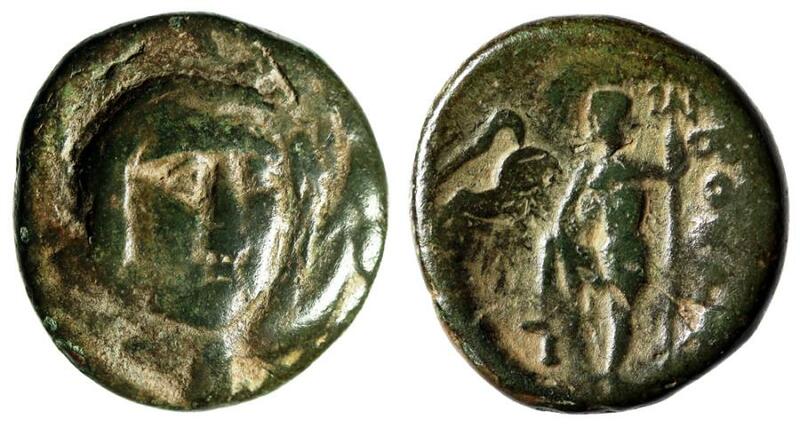 Boeotia, Federal Coinage Overstruck on Antigonos Gonatas "Demeter & Poseidon"
Boeotia, Federal Coinage. Circa 220’s BC. Obverse: Head of Demeter or Kore (Persephone) facing slightly right, wearing wreath of grain ears. Reverse: Poseidon standing left, right foot on rock, holding trident. References: BCD Boiotia 100-9. Size: 18mm, 4.35g. Professional Numismatic Notes: Good-fine with a pleasing green patina. An famous over-strike with a clear under-type on this specimen (Reverse of Antigonos, Horseman saluting right).